This home is professionally managed by Beach Habitats 30A. * NO ROADS TO CROSS on the way to the beach!!! *On the GULFSIDE of 30A, with lots of porches for the best views of the water, beach, and the sunsets. Private paradise located on private ,dead end lane with private boardwalk to the beach - just 50 feet from the front door. Ample parking under this 3 story home makes it Great for family reunions or large party get-togethers. Or you may rent one side for smaller parties of six to ten. The homes share an adjoining door on the 2nd floor for convenience when rented together. The PERFECT BEACH HOUSE for FRIENDS AND FAMILIES to enjoy their own space yet be together... Each side has one King Master bedroom with private bath, one king and one Queen bedroom each with full bath, and a Study with a Queen sleeper sofa, as well as a desk ready for your laptop. Additionally, Sunrise and Sunset both have twin bunk bedrooms with TV's, great hide out for the kids. Poolside offers another bath and changing area with outside hot/cold shower. Beachy style is reflected in the interior with special details of dead head cypress trim to add to the old/new charm. Owned by sisters who spent summers on the beach, we built twin homes that celebrate friends and family. Rent one side or both. You decide!! !Houses built in 2000. Yes!! YOU have found the best spot to enjoy it ALL! My sister and I built these homes in 2000. The property has been in the family since 1950. We are 5th generation Walton Co. residents and take pride in our vacation rental. Our homes are family owned and run. The homes are built for large families to enjoy time together. Large rooms and the private location is unique to 30A. We hosted a wedding on 30 A in Watercolor and rented both HMS Sunrise and Sunset. Family members coming from both coasts and Alaska this property made for a perfect destination to have a Family Retreat and Wedding Celebration. Dual Kitchens and Family rooms connected allowed us to enjoy Family in an at home atmosphere while still having resturants and beach within short walking distance. The property was well kept and clean. Beach Habitats 30A was easy to work with and would highly recommend them. We are so glad you had such a great time. Beach Habitats 30A team. We have a group of 20 (5 families) who vacation every year. 5his has by far been the best house we have stayed in. The kitchens were fully stocked and spacious! We loved all the balconies. There was plenty of room to spread out. It was great being able to walk down to the beach and know that you would have a spot on the beach to set up. It was not overrun by hotel/condo guests. The pool was wonderful and we loved having outdoor bathrooms/showers! We had an issue with a broken door when we first arrived and someone was out to inspect within 20 minutes of our call. We were very pleased with our experience and plan to book next year and possibly many years to come! We had a blissful week at the beach, with a large family group ranging in age from 3 months to 64 years! Renting both sides, there were opportunities to be as together or as apart as anyone wished to be, and even the teens had spaces to claim as their own. 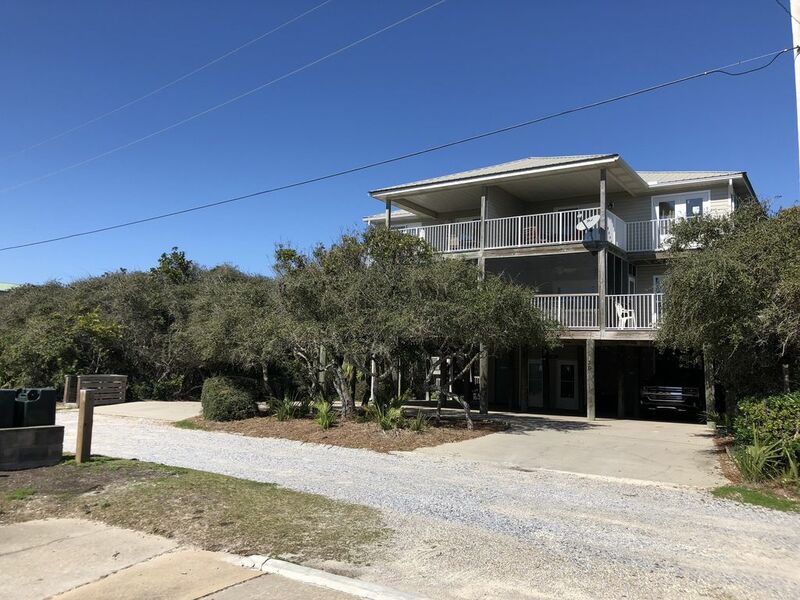 For the adults, who have visited this part of the Gulf for 20+ years, we especially enjoyed the feel of a beach home on a private dirt road, which felt miles from the bustle of 30A. We gathered on the deck each morning to share coffee, and watch dolphins play in the surf. One morning we were delighted to see a manatee amble up the coast! We watched the children on bicycles in front of the house, and never worried about traffic. Yet we were one small block away from the best of anything anyone would want or need during a week of vacation. (The only thing we didn't do was move our cars!) The kitchens were fully stocked for the chefs in the family, and the full sized laundry rooms were just what we needed with kids. Typically, after a successful rental experience, we can't wait to tell all of our friends and co-workers about our beach house. This year, we don't want to tell anyone! We just want to keep it our little secret! Seriously, it was perfect for us, and wonderful memories were made. My family started planning about one year out and we could not have been more pleased with this house. We all fell in love with the 30A area and will be back for future trips. Because we would have a large group, we rented both sides and had plenty of room to spread out. We opted to cook most of our dinners at the house and having both kitchens was a plus! WiFi was iffy at times (we sometimes had as many as 6 or 8 trying to connect so the problem may have had more to do with our numbers rather than the quality of the WiFi). There are a lot of steps with this property so if you are mobility challenged (i.e. bad knees) be warned you want the first floor bedroom. The beach was great--and the location cannot be beat--while you had to walk about a half block worth of boardwalk to get there, being on the beach side of 30A you did not have to cross the main road which is a definite plus for any beach vacation with young children. The pool is a great bonus if you want to be in the water but find it too hot on the beach or the Gulf is too rough for the little ones. You are within walking distance (within a mile) of two great restaurants 723 Whiskey Bravo and Cafe 30A. You are also within easy biking distance of Seaside and 10 minutes from Rosemary Beach/Alys Beach and Seacrest so there is a lot of diversity and lots to do within a few minutes of this property (15 minutes to Grayton Beach area). Goatfeathers II is almost next door if you want great fresh seafood to cook. We went with the Butterfly Bike Rentals next to the Snappy Turtle a few blocks to the east and were very pleased with their service. I would definitely recommend to a friend and would love to rent this property in the future should the opportunity arise. So good to hear such positive response. We work hard at trying to make the house a great place for families to vacation. Thanks to the renter and their great review. We had a wonderful time at the house! We loved the Seagrove Beach area, and the Seaside Area. What we really loved, is that this house was on a private road, not busy 30A, but still within walking distance to restaurants and shops. We recommend Bruno's Pizza, The Donut Hut (which had it's grand opening while we were there), Seagrove Village Market Cafe, and Whiskey Bravo, as some of our favorites! We also enjoyed The Shops of Old Seagrove, which are behind Whiskey Bravo. The beach access was close by, and the private walkway to the beach was great. It was nice having benches on the walkway, too, so family members could sit there and still see what was happening on the beach. The house had everything we needed for our many family dinners, and all the furnishings were very nice! There were plenty of bedrooms (6 bedrooms, 2 office spaces with convertible beds, plus 2 bunk rooms), and plenty of bathrooms! They also had many beach and pool toys, though we did bring along a few beach chairs (several were provided). We had such a great time, and are already making plans for our family beach vacation in 2015! The positive review makes all my hard work worth it. I am so glad the renters enjoyed their vacation time.